HOLDEN - Tonight I took the trek out to Holden to catch a CMass heavyweight matchup between the Wachusett Mountaineers and the Algonquin Tomahawks. Though the Mountaineers would pull out a 39-17 victory, the game felt close throughout. 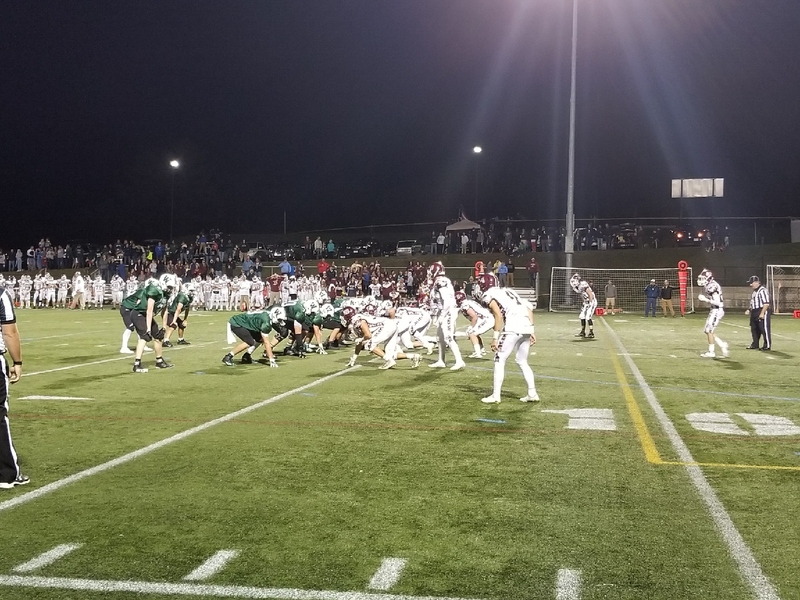 The win gave Wachusett a measure of revenge, after Algonquin defeated the Mountaineers both in the regular season and playoffs last year. Let’s break down Friday's big win for Wachusett. Q1: Both defenses would play a little bend-but-don’t-break, and the quarter would end 0-0. Q2: Algonquin would start the quarter in good field position and take a 3-point lead on a FG. Wachusett would reply with a drive resulting in a Sam Brewer touchdown to take their first lead of the night, 7-3. The T-Hawks came right back at them though, and QB Hayden Kea would make a couple of nice throws, including a pretty touchdown pass to put his team up 9-7 (2-pt attempt failed). As if 16 combined team points in the quarter weren’t enough to make up for the scoreless first, Wachusett QB Mike Shabo put two long throws on the money to Barry Walsh, who caught one of them for 40 yards, and the other in the back corner of the end zone. First half would end 14-9 Wachusett. Q3: Wachusett received the half-opening kickoff and would engineer a methodical drive, resulting in a short field goal. Algonquin would get the ball and go 3-and-out, but would have the punt BLOCKED on fourth down by Kyle Wall (recovered by Tyler Hearn of Wachusett). Mountaineers would capitalize on the good field position, with Sam Brewer finding the end zone for his second time in the evening. Algonquin, looking for their first points of the half, took a deep shot to John Polymeros which set them up in the red-zone. Kea would connect with Casellini for a prompt touchdown on a wide receiver screen, and suddenly we had a one-score ball game again. 24-17 (2-pt attempt good). Q4: To start the fourth, Sam Brewer earned his hat trick, as he broke the plane for the 3rd time this evening. After the PAT, the Mountaineers led 31-17. Algonquin would take a few deep shots in effort to steal a quick score and get back into it, but the Mountaineer defense would hold them, and even get the ball back to the offense. J’Zhon Henderson would find the end zone for his first score of the night with 4:22 to play in the game, extending the Wachusett lead to 22 (2-pt attempt good). Tough loss for the T-Hawks. The loss of some key players from last year’s team is evident, but I would by no means say this team is in trouble. They have a capable quarterback and some good speed on the outside. Where they lost tonight was in the trenches. Wachusett's front 7 had a great game penetrating the Algonquin O-Line. Nothing that can’t be mended. After all, this team has a lot of talent. They were just simply outplayed tonight. A little game film work, a few quicker releases from Kea on passes, and I think we will be seeing this team in the hunt for the playoffs yet again. But hey, just because this one journalist thought the passing was exciting, doesn’t mean you should change a formula that just won you a game 39-17 over a good Algonquin team. All business starting tomorrow morning as the Mountaineers begin to grind for what should be a physical, intense matchup between two CMass powerhouses next week.